This week, measurements from PIOMAS indicate that Arctic sea ice volume for the month of March hit new, all-time record lows during 2017. March 2017 volume, according to the Polar Science Center, dropped about 1,800 cubic kilometers from the previous record low set during the same month in 2011. In total, more than a third of March sea ice volume has been lost since 1979. Arctic sea ice volume through March 2017 continued substantially below prior years. March 2017 sea ice volume was 19,600 km3 , 1800 km3 below the previous record from March in 2011. This record is in part the result of anomalously high temperatures throughout the Arctic for November through January discussed here and here [and here]. February volume was 39% below the maximum March ice volume in 1979, 27% below the 1979-2016 mean, and more than 1.7 standard deviations below the long term trend line. This increasingly thin ice cover should continue to grow a little more to reach a seasonal peak during the first or second week of April. And as you can see when looking at the graph below, the trend line following that peak does not paint a very optimistic picture for sea ice resiliency during the 2017 melt season. Merely transposing the present gap between March 2017 and the last record low to the end of melt season in September would about split the difference between 2012’s record melt and a completely ice-free Arctic Ocean — leaving about 1,700 km3 sea ice remaining by September of 2017. A more detailed meta-analysis of this rather ominous-looking trend line finds that after hitting a peak of around 20745 km3 of sea ice sometime this month, an average of 18270 km3 of this ice will tend to melt out during the spring and summer so long as the past 10 melt seasons are a reliable predictor of future results. If this happens, sea ice volume will hit a new record low of around 2,530 km3 by September — which would be about 1/3 smaller than the amount of ice remaining in the Arctic Ocean following the tremendous 2012 melt season. And a very strong melt season — similar to conditions seen in 2010 — could reduce the ice to less than 1,000 km3 which is well into the range of a near-ice-free state. Of course, April through June could see cooler conditions — which would tend to preserve more ice and tamp down the ultimate rate of loss. But the present record low sea ice volume and near record low extent sets up a situation where darker seas will absorb more sunlight and stack the odds in favor of warmer than typical conditions and higher overall rates of melt. Meanwhile, presently strong sea ice export through the Nares and Fram Straits appears to be continuing a trend of relative sea ice volume loss through early April. This past weekend, it rained over the ice of the late winter Kara Sea. Falling liquid drops that whispered of the far-reaching and fundamental changes now occurring at the roof of our world. For an Arctic suffering the slings and arrows of human-forced global warming, the winter ended just as it had begun — with an ice-crushing delivery of warm air from the south. A burly high pressure system over Russia locked in an atmospheric embrace with a series of low pressure systems stretching from the Barents Sea down into Europe. Winds, originating from the Mediterranean rushed northward between these two opposing weather systems — crossing the Black Sea, the Ukraine, and swirling up over Eastern Europe. The winds wafted warm, above-freezing air over the thawing permafrost of the Yamal Peninsula. And the frontal system they shoved over the melting Arctic sea ice disgorged a volley of anomalous late-winter rain. As this rain hissed over the ice, delivering a load of heat to its fractured and frail surface, temperatures above the Kara Sea rose to 1 to 2 C — or about 25 to 30 C warmer than average (42 to 54 F warmer than normal). Meanwhile, the frontal boundary lofted by the warm winds rushed on — pushing above-freezing temperatures all the way into the Laptev Sea north of Central Siberia. This most recent rush of warm air to the ice edge region came as a kind of herald for the start of melt season. Melt season start is an event that takes place every year at about this time. But during 2017, the sea ice set to begin this annual melt has never been so weak. The fall and winter warmth has been merciless. Month after month of far warmer than normal temperatures have pounded the ice. And now both sea ice extents and volumes are lower than they have ever been before — or at least since we humans have been keeping track. After a drop of almost 262 thousand km2 in just three days, it looks highly likely that the maximum for sea ice extent was reached two weeks ago, according to the data provided by JAXA, the Japan Aerospace Exploration Agency (via ADS-NiPR ; it used to be provided by IJIS). As melt season starts, another record low for sea ice extent maximum raises some serious concerns. The less ice that covers the ocean, the more dark blue surface is left open to absorb the sun’s rays. And this loss of ice poses a problem in that a less ice covered Arctic Ocean can take in more heat during melt season — which can serve as an amplifier for melt rates. During 2015, Arctic sea ice extent also hit a record low maximum, which was nearly beaten again in 2016. But these losses thankfully did not translate into new record lows by the end of the 2016 summer melt season. Weather, as ever, plays its part. And there is some evidence to indicate that increased cloud cover caused by higher levels of water vapor above the Arctic may help to shield the ice somewhat during warmer months. A feature, however, that did little to prevent severe sea ice losses during the record summer melt of 2012 in which a powerful Arctic cyclone also played a roll in ice melt. Sea ice extent is the measure of how much ocean the ice covers to its furthest-reaching edge. But it’s not the only measure of ice. Volume, which is a measure of both sea ice area and thickness, probably provides a better overall picture of how much ice is left. And the picture of sea ice volume going into the melt season for 2017 isn’t looking very good at all. 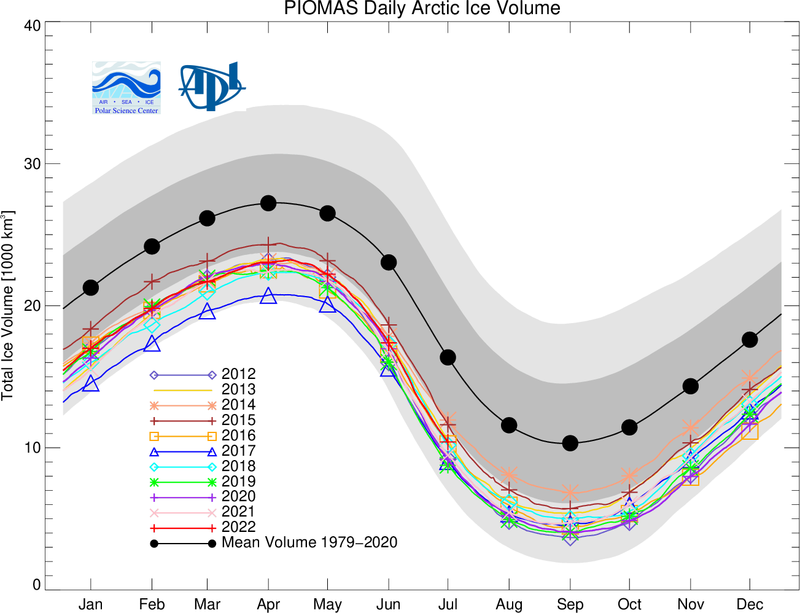 Sea ice volume is now tracking about 2,000 cubic kilometers below the previous record low trend line for this time of year. In other words, the trend line would have to recover considerably over the coming months in order to not hit new record lows by the end of this melt season (September of 2017). What’s happened is that the ice has experienced three consecutive very warm winter periods in a row — 2015, 2016 and now 2017. And a resulting considerable damage to the ice increases the risk that new all-time record lows will be reached this year. If the present volume measure remains on track through end of summer, sea ice volume could well split the difference between 2012’s record low of approximately 4,000 cubic kilometers of sea ice volume and the zero sea ice volume measure that represents an ice-free Arctic. This discussion is worth consideration given how much heat we’ve seen in the Arctic recently. However, we are unlikely to see such a neat progression. Spring and summer surface temperatures could track closer to normal ranges and cloudy (but not overly stormy) conditions could give Arctic albedo an assist — causing the melt rate to lag and pulling the volume measure closer to the trend line. But, it could also vary in the other direction. For post La Nina (we have just exited a weak La Nina) the ocean gyres tend to speed up — which enhances sea ice export — even as more heat tends to transport in the final post El Nino plume toward the poles. If this particular form of inter-annual natural variability trend toward warmth and melt in the Arctic takes hold during 2017, then we will have less chance to see a spring and summer sea ice recovery toward the trend line. And this is one reason why we’ve been concerned since 2015 that 2017 or 2018 might see new record lows during the summer for Arctic sea ice. During late February, Antarctic sea ice breached the previous all-time record low for extent coverage since measurements began in 1978. And in the following days, sea ice extent measures near the South Pole have continued to creep lower, gradually extending into unprecedented ranges. Hitherto unseen global heat — driven primarily by human fossil fuel emissions — appears to be the chief contributor to this melting. During 2016, global average surface temperatures rose to 1.2 degrees Celsius above 1880s ranges. This global reading likely represents the warmest surface temperatures the world has experienced in the last 115,000 years. At the same time, the global ocean system has been rapidly accumulating warmth and transferring it through the surface and deep layers of the world’s waters. Such pervasive heat is producing an ongoing trend of considerable sea ice melt in the Arctic — a trend that has been in place since record-keeping began in 1978. One that, all by itself, is strong enough to drag global sea ice measures lower and lower. The warmth is also producing land ice melt around the world — including glaciers in Antarctica, Greenland and across numerous mountain ranges. Sea ice melt in the Antarctic, however, is a possible new feature. In the past, it is thought that fresh water outflow from glaciers in Antarctica and strong winds encircling the Southern Hemisphere sea ice helped to protect it from the initial pulse of human-forced warming. And as recently as 2014 and 2015, Antarctic sea ice experienced new record high readings even as the long-term trend hinted at a possible slow expansion of sea ice near the South Pole. Researchers had indicated that the protection for Southern Hemisphere sea ice might only last as long as fragile wind patterns around the South Pole remained. For 2016 and 2017, however, that thin veil of protection appears to have fallen. Previous record lows for Antarctic sea ice extent set in 1997 at 2.26 million square kilometers sea ice coverage during the austral summer month of February have now been exceeded by 100,000 square kilometers. As of yesterday, according to JAXA, the new record low stood at 2.16 million square kilometers. Antarctic refreeze typically starts during mid-February as seasonal cooling sets in. However, 2017’s warmth has driven an extension of late season melt with Antarctic sea ice continuing to decline through the end of February. At some point during the next week or two, however, refreeze is likely to finally kick in. But this return to rising ice coverage may be still be delayed somewhat by very warm Antarctic temperatures predicted to range as high as 2.9 C above average through the next five days. This year’s all time record low for Antarctic sea ice extent also comes at a time when the Arctic has been experiencing daily, monthly and seasonal record lows. Highly unseasonable temperatures have dominated Arctic Fall and Winter during 2016 and 2017 — producing never before see low extent coverage during the period. As a result of record lows occurring at the same time in the north and in the south, overall global sea ice coverage has taken a considerable beating and the larger global sea ice trend is now strongly negative. What’s Going on With Antarctic Sea Ice? Extreme Arctic warmth this fall has again pushed sea ice levels into record low ranges. Across the Arctic, temperatures for the months of September and October have ranged between 3 and 5 degrees Celsius above normal for the entire region above the 66 degree north latitude line. Such extremely high temperatures have served to slow the rate of sea ice accumulation. The result is that the line in the sea ice graphs appears to be moving more sideways than following the traditional upward trend for this time of year. Trend lines for 2016 are also now within 90,000 square kilometers of exceeding previous record lows for sea ice extent set in 2007 and nearly matched in 2012 for the date of October 17. Over the next few days, GFS model runs predict that a strong warming trend will take hold over the Arctic Ocean environment. As a result, temperature anomalies for the region above 66 North are expected to again spike to near 5 C above average for this time of year. Given this predicted heat build-up, it’s certainly possible that refreeze rates will continue to be inhibited and that new record daily lows will be breached this week. Meanwhile, the overall trend for 2016 from January through middle October shows a year that is likely to see the lowest averaged levels of sea ice ever recorded for an entire year. Loss of sea ice is a primary feature of polar amplification in the Arctic due to human-forced climate change. Under polar amplification, warming of this region occurs faster than in the rest of the world. During summer, lower sea ice levels allow more sunlight to be absorbed by dark ocean waters — which preferentially traps heat in the Arctic environment. Less ice coverage during winter allows ocean heat to re-radiate into the Arctic which provides a significant boost to temperatures during the cold season. Last year, a never-before-seen late December warming of the Arctic pushed temperatures at the North Pole above freezing. If human fossil fuel burning continues and greenhouse gas accumulations in the Earth’s atmosphere keep rising, the Arctic is in for more dramatic fall, winter, and spring warming events than even those it is experiencing today. And with global temperatures entering a range of 1-2 C above preindustrial averages, the risk of a complete loss of Arctic sea ice over the coming years is on the rise. Back in 2012, a powerful Arctic cyclone smashed the sea ice with days of wind and waves. This year, a storm that’s nearly as strong threatens to make a similar mark on late-season melt. With a very unstable Arctic weather pattern in play, there’s an outlier possibility the dynamic is setting up for something even more dramatic by late August. Earlier today, a strong gale roared up out of the Laptev Sea north of central Siberia. Feeding on the abnormally warm, moist air over the Barents Sea and the hot air over northwestern Siberia, the storm collided with comparatively cold air over the central Arctic. The differences between hot/cold and damp/dry air can really bomb out a storm system. Central pressures in the storm fell to 969 millibars and the winds whipping out over the Laptev, East Siberian, and central Arctic waters gusted at 45 to 55 miles per hour. Waves of 6 to 10 feet or higher roared through the newly-opened waters filled with increasingly dispersed ice floes. The Great Arctic Cyclone of 2016? This powerful storm is pulling these strong winds over some of the weakest and thinnest sections of Arctic sea ice. During July and August a huge section of ice running along the 80° North Latitude line and stretching from the Laptev, through the East Siberian Sea, and into the Beaufort Sea grew ever more thin and eventually dispersed. Now 25 to 60 percent ice concentrations in this region abound — a tongue of thinning which stretches nearly to the North Pole itself. The storm is generating waves, mixing warmer-than-normal surface waters with even higher temperature waters just below. These sea surfaces are between 1 and 2 degrees Celsius above average over much of the area, with pockets of 3 or even 4 C above normal surface water temperatures interspersed. The storm’s Coriolis Effect will spin chunks of ice out from the pack to float lonely in these warmer-than-normal waters as they are churned by the raging swells. Currently, the storm’s strongest winds and waves are running through a big melt wedge that extends from the Laptev and East Siberian Seas toward the 85th parallel. The motion and force produced by the storm’s winds and waves will eject the ice currently located over the northern East Siberian and Chukchi Seas even as waves eat into it. Upwelling of warm water in the seas beneath the center of the storm will open and disperse the ice, generating holes and polynya as it tracks north of the 85th parallel and toward the Pole. Compared to the Great Arctic Cyclone (GAC) of 2012 — an event that helped to tip that year into the strongest late-season melt on record — this storm is a bit weaker. The GAC bottomed out at 963 mb and carried on for about four days. The current storm, by comparison, is expected to remain in place for quite some time even as it slowly weakens over the coming days. Arctic sea-ice extent values are now tracking at around third lowest on record, or just above the 2007 line. Such a strong storm certainly has the potential to knock a big hole in the ice, possibly propelling 2016 closer to 2007 ranges or even beyond them. Surface waters in the Laptev, East Siberian, Chukchi, and Beaufort Seas aren’t quite as warm as they were in 2012, but there’s still a lot of potential here for storm-associated melt. Meanwhile, the very warm waters over the Kara and Barents Seas remain a disturbing feature. Models predict that lows will continue to feed in from the Atlantic and northeastern Siberia along various high-amplitude waves in the Jet Stream to combine in a triangular bite between the East Siberian Sea, the Laptev Sea and the Pole. Such continued reinvigoration will tend to enforce a generally stormy and unstable atmosphere. And there’s some risk (small, but worth considering) that the current storm could refire into something more powerful on the fuel provided by one of these lows. Already, a few of the long-range models are popping with amazing predictions of storm-center intensity in the range of 950 to 960 mb. Both the GFS model and CMC models separately produced these results for the nine to 12 day timeframe. GFS had backed off its own high-intensity forecast when this odd CMC run popped up (see below). Though these are long-range outliers, there is quite a lot of fuel for strong storms in the region this year due to conditions related to human-caused climate change. In particular, ocean surfaces in the Barents and Kara Seas are in record-hot ranges. And the heat and moisture coming off those waters is fuel for some serious atmospheric instability as the Polar region attempts to cool. Any significant cooling in the 80-90° North Latitude region would help to generate a strong dipole between this zone and the Kara-Barents. Such a dipole would create strong instability for storm generation. A low bombing out at 953 to 955 mb in ten days, as the CMC model currently indicates, would represent an Arctic megacyclone with serious potential to wreck sea ice. The location predicted would generate a strong push of warm water from the Barents and Laptev and on toward the ice-clogged polar waters. The resulting Ekman pumping and powerful swell generation would have the potential to generate severe ice losses in the late August timeframe. Over the past 10 days, the rate of sea ice extent loss in the Arctic has slowed down somewhat. And as a result sea ice extent measures, though maintaining in record low ranges, are much closer now to the 2012 line. Low pressure systems have come to dominate the Arctic Ocean zone. And the outwardly expanding counter-clockwise winds from these systems have tended to cause the ice to spread out and to thin. In the past, such events were seen as an ice preserving feature. But this year, there’s cause for a little doubt. The first cause comes in the form of record Arctic temperatures for all of 2016. As Zack Labe shows in the compelling graphic below, not only has the first half of 2016 been a record warm six months for the Arctic, it’s been a record warm half-year like no other. And if extra heat is guaranteed to do one thing — it’s melt frozen water. We can see that in the current near record low snow coverages for the Northern Hemisphere. We can see it in the fact that — despite what would be ‘bad melt’ weather conditions such as cloud cover and low pressure systems dominating the Arctic during the middle of June — Arctic sea ice extents are still in record low ranges and Arctic sea ice volume continues to track just below 2012’s record low trajectory. And we can certainly see it in the fact that despite the clouds that would normally promote cooler Arctic conditions during this time of year, surface temperatures have remained well above normal for the majority of June. Overall, these conditions are unprecedented for the Arctic. And, in microcosm, we can tell a little bit of this story of heat by tracking the life of a ten mile wide hunk of ice that was recently blown away from the ice pack and into the warming waters north of Svalbard. On June 8th, this ten-mile wide chunk of ice was ushered away from a thinning but concentrated grouping of ice about 80 miles to the North of the Island Archipelago of Svalbard. In past decades during June, the sea ice had tended to remain closer to Svalbard, often enveloping this Arctic island chain straddling the 80th parallel. But during recent years sea surfaces around Svalbard have dramatically warmed due to a human-forced heating of the atmosphere and oceans. And today, sea surface temperatures surrounding Svalbard range from 1 to 8 degrees Celsius above 20th Century averages. That’s still cold water in the range of 32 to 46 F. At least to the human perspective — as neither you nor I would find it a pleasant experience to plunge into sea waters that are still relatively close to freezing. But to sea ice, this water is basically warm enough to represent an oceanic killing field. By June 10, our ten mile wide hunk of ice had been ejected about 30 miles into this warm water zone north of Svalbard. After only two days, the previously contiguous structure of the ice is riddled with cracks large enough to be plainly visible in the 250 meter satellite resolution. The sudden contact with warmer waters was more than enough to shatter the surface of this island-sized hunk of Arctic sea ice. Export into warmer waters has long been a melt issue for ice moving out through the Fram Strait. And loss of ice in this fashion due to strong winds circulating clockwise around Greenland has become a growing concern. Ice originating in the thick (though much thinner than in past decades) ice pack north of Greenland can be funneled along the Greenland Coast and eventually propelled out into the warmer waters of the North Atlantic where it has no chance to survive. But this is exactly what happened to this 10 mile wide chunk of ice as it entered waters North of Svalbard. It exited the ice pack, lost access to the fresh water field protecting the ice. It entered 1-3 C surface waters. And it basically disintegrated. Arctic Ocean Near Summer Melt Tipping Points? Added Arctic heat is not just a measure, therefore, of atmospheric temperatures. It’s a measure of implied ocean surface heat and ocean heat lurking just beneath the surface. In the end, what we see is that new ways to lose sea ice are now emerging. And it appears that sea ice export into the northern Barents and near Svalbard waters is yet one more sea ice melt risk potential. It’s a matter worth bringing up due to the simple fact that this zone of ocean water was once frozen, was once a consistent part of the Northern Hemisphere ice pack. And after warming just enough, it’s a region that is now hostile to sea ice. Looking north, there’s risk that human caused climate change will drive that ice hostility zone into the near polar region itself. During the melt phase, broken ice can generate a bit of negative feedback by promoting cloud formation through increased water evaporation and reduced albedo as surface melt ponds are essentially dumped back into the ocean. But such floes are at the mercy of transport and waves. And they sit upon a warming surface ocean. A discontinuous floe can hit a melt tipping point pretty rapidly — covering a large region and then disappearing in a very short period. We’ve seen instances of such events during late June for Baffin Bay, Hudson Bay, and the Kara Sea. Now, much of the Arctic Ocean is covered by these floes. And with so much heat in the system, it’s worth considering that the old rules no longer fully apply. 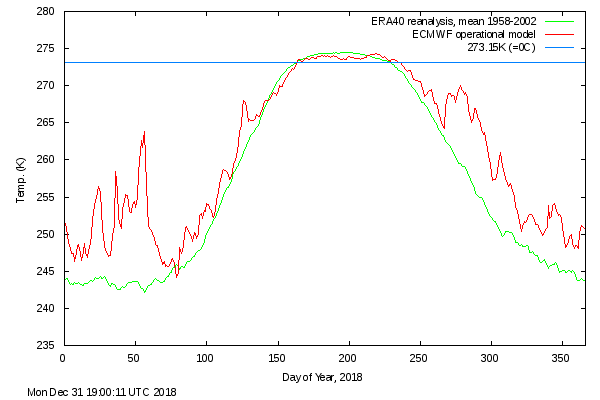 It’s worth realize that the ice is dancing in an increasingly tenuous temperature zone between the warming waters below and the warming airs above. We’ve never seen May heat like what’s being predicted in the Arctic over the next seven days. A shot of warm airs blowing northward over Siberia that are expected to generate a warm front that takes in nearly the entire Arctic Ocean. A weather pattern that, if it emerges, will completely compromise the central region of polar cold that has traditionally driven Northern Hemisphere weather patterns. This week, a huge pulse of warm air rose up over Northwest Canada and Alaska. Invading the Beaufort, it drove a broad warm front which forced near or above freezing temperatures over between 1/4 to 1/3 of the Arctic Ocean zone. Regions from the East Siberian Sea, through the Chukchi, into the Beaufort, and including a chunk of the polar zone above the 80th parallel all experienced these anomalously warm readings. By Friday, air temperature anomalies in the entire Arctic zone above 66 North were about 3 C above average and in a large section of the hot zone centered on the Beaufort temperatures ranged between 10-15 C above average. For the Arctic, it appeared that June had arrived a month early. The effect of all this heat — just the latest hot flare during a record warm 2016 — on the sea ice has been tremendous. Huge areas of dark, ice-free water have opened up. The Bering is practically ice free. The Chukchi is plagued with thin ice, large polynyas, and melt ponds. Baffin Bay and the Barents are greatly reduced. And in the Beaufort a massive 120 to 200 mile wide region of open water continues to expand. Pretty much all the major monitors now show Arctic sea ice plummeting deep into record low ranges. The JAXA extent measure yesterday rocketed past the 11.5 million square kilometer mark with barely a blink following multiple days of 100,000 square kilometer losses. DMI looks like the bottom dropped out of its own extent and volume measures. And NSIDC shows Arctic sea ice extent levels widening the gap from previous record lows for this time of year. Overall, not only is the sea ice less extensive and thinner than it has ever been for this time of year, but the rates of loss it is now experiencing are more similar to those that would typically be seen during June and July — not May. In such a context of record heat and melt, current new sea ice extent lows are about 9-10 days ahead of the previous record low, 22-24 days ahead of the 2000s average line, more than a month ahead of the 1990s average line, and fully a month and a half ahead of the 1980s average line. In other words, there is something seriously, seriously wrong with the polar region of our world. As bad as the current situation is, the coming week looks like it’s setting up to be far worse. A second massive polar warm front is in the process of bulging northward from the region of Eastern Siberia near the East Siberian Sea. This warm front — driven on by an anomalous ridge in the Jet Stream and backed by warm winds flooding up from the East Asian heatwave and wildfire zone — is predicted to bow outward over the coming five days. It is expected to encompass all of the East Siberian Sea and the Laptev, traverse the 80th parallel, continue on past the North Pole, and then flood out into the Barents. Essentially, it’s a warm front that will cross the polar zone in total — completely ignoring the laws of Jet Stream dynamics and basically rupturing what is traditionally an area of cold centering on the Pole. In four years of unbroken Arctic observation and threat analysis related to human-caused climate change, I’ve never seen anything like this. And given the odd effects of fossil fuel emissions-forced climate change, I’ve definitely observed some pretty weird stuff. To say this really kinda takes the cake for Arctic weirdness would be an understatement. By May 20, most of the Arctic Ocean is predicted to see near-freezing or above-freezing temperatures. Readings warm enough to promote surface melt of the ice pretty much everywhere and across all basins. Readings that for the entire Arctic region above 66 North are predicted to be 5 C above average. That is one hell of an anomaly. Something that would be odd if we saw it during January (when climate change related seasonal warming has typically taken greater hold). But for May this is absolutely outlandishly hot. These are conditions that even during the previously record warm period of the 2000s normally didn’t take come into play until late June or early July. Conditions that were practically unheard of for any single day at the peak of summer warmth during the 1980s. Conditions now predicted to happen in late May. This is climate change, folks. Pure and simple. And if such a pattern of extreme heat continues, it may wipe out practically all the ice by the end of this melt season. This week, it looks like that dreaded event will grow still more likely if this predicted insane heat break-out into the Arctic emerges. An event many scientists thought wouldn’t be possible until the 2070s or 2080s as little as ten years ago. A Blue Ocean Event that is now a very real risk for 2016. Extreme weather and climate change. The plight of human civilization facing loss of coastlines, stable climates, and predictable growing seasons. The plight of the polar bear. How are they all linked? Well, for one, it now appears that one of the most powerful storms to strike Iceland — an extraordinarily intense 928 mb low pressure system dubbed Frank by the UK Met Office — has played its hand in helping to drive Arctic sea ice to new daily record lows. The storm, associated with a powerful high amplitude wave in the Jet Stream, aided in shoving some of the warmest temperatures ever recorded over the North Pole. Setting off a rare period of above freezing temperatures during polar night, this extreme weather event dumped an unprecedented amount of heat into the Arctic during what is typically its coldest season. It’s the kind of atmospheric heat engine whose climate and weather altering impacts I discussed with Dr. Jeff Masters, Dr Steven Amstrup, and the hosts of Voice of America’s news show #Hashtag — Michael Lipin and Andrew Palczewski — today. The kind of extreme events that become more and more common as the world warms up, dumping an inordinate amount of latent heat into storms as they form and intensify. But this particular event’s far-ranging impact could also be seen in a warm temperature shift for the High Arctic during Winter. A shift that brought with it a flatlining of Arctic sea ice accumulation. Typically, during December and on through mid-April, Arctic sea ice area and extent values continue to rise. The cold of polar night settles in over a broad area of water. Bereft of the heating rays of the sun and typically plunged into temperatures well below freezing, the ocean surface becomes covered in an expanding cap of ice. There it provides a stable environment for so many Arctic creatures that have made that place their home. But it has also helped to provide the stable climate of the Holocene — in which for more than 10,000 years human beings and our civilizations have been able to thrive. This year’s massive Arctic warm-up, in association with Frank, appears to have stranded that essential ice accumulation in dead stop. And as of January 4th, according to the National Snow and Ice Data Center, Arctic sea ice extent totals remained at 12.8 million square kilometers. That’s about 90,000 square kilometers below the previous record daily low set on the same day just five years ago during the Winter of 2011. It’s also an extent value fully 1 million square kilometers, an area the size of Texas and Montana combined, below the already depleted 1981 to 2010 average. Cryosphere Today showed Arctic sea ice area also following that ominous flatline pattern — hitting 12.23 million square kilometers in coverage or the second lowest area on record for the day. 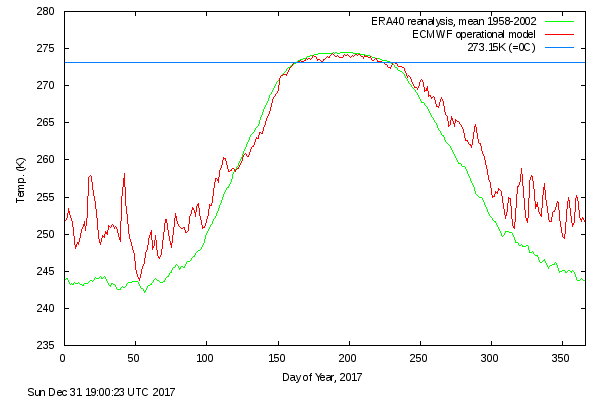 Continued warmer than normal temperatures in the Arctic in the range of 3 to 3.5 C above average for the region may well continue to drive this sea ice flat line over at least the next couple of days, pushing area measures into new record low readings even as extent continues to break records. Failure to freeze during Winter is one of the driving factors of major Arctic sea ice declines during Summer (often called Winter power over at the Arctic Sea Ice Blog). So with sea ice hitting new lows for a, much warmer than normal cold season, we may need to watch out for potential new major losses come summer time. And that’s bad news for everyone — seals, walruses, polar bears, human beings and for many of the creatures below the Arctic Circle that rely on that frozen region for the maintenance of the climate they evolved and adapted to live in. Dr. Steven Amstrup, who has been a fearless advocate for the innocent creatures most likely to be impacted early by human-forced warming of the Arctic, I’m pretty sure, would agree.